Now that we’re home from Disney World, I can officially say that late August is a decent time to go. It was very humid, but there were also scattered showers and periods where the sky was overcast and the temperature was pleasantly warm rather than hot. Those days were the best! Our hotel was called The Boardwalk Inn. It was our first time at the hotel, but we knew the area well having stayed at the nearby Swan and Dolphin. 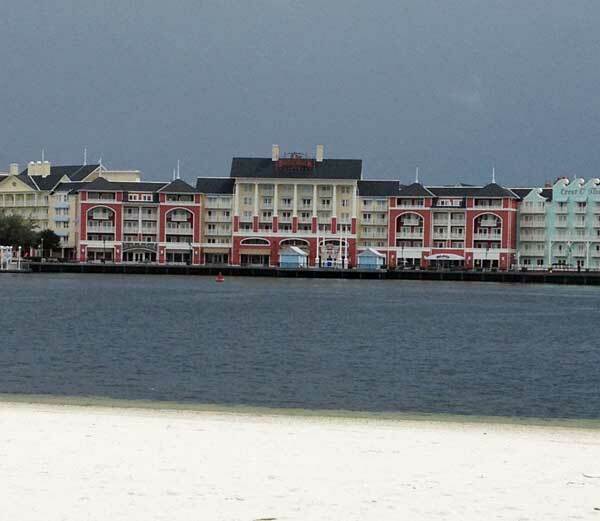 I took this picture of the Boardwalk from the front of the Beach Club hotel. The area is designed to look like an old time New England beach resort – a combination of Martha’s Vineyard, Cape Cod and Coney Island all rolled into one. There are jugglers, surrey rides, boats and everything is within walking distance to Epcot and Hollywood Studios, which are the two parks we like the most these days. So right now I’d say The Boardwalk area is my favorite place to lodge , and in honor of that I’ve made the famous brownies that are attributed to the area’s favorite bakery. I don’t know if this is truly a Disney recipe, but it’s a nice tribute either way. As mentioned, the brownies are named after The Boardwalk Bakery (next door to Cat Cora’s excellent restaurant, Kouzzina), which Fuzz and I discovered was so popular at breakfast time that in order to purchase anything, you had to wait in a very long line. This is my excuse for not actually buying one while at Disney World. It’s a bad excuse and I probably should have stood in the line, but I’d just about had it with lines and Fuzz and I ended up eating an orange back in the room. Plus I knew I had this recipe to come home to, so it wasn’t a big deal. Okay, so about the recipe. Some of you will immediately notice the copious amounts of butter and oil, but keep in mind there’s a large amount of corn syrup, sugar, eggs and flour to balance it all out. These brownies are rich and fudgy, but not greasy tasting/feeling….at least not to me, and especially not after having been chilled. 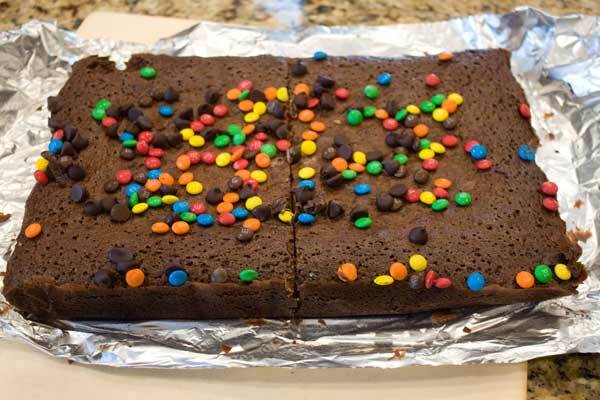 The recipe makes a full 9×13 inch pan of very hefty, bakery style brownies. I cut mine into 16ths for the photo and each 16th weighed about 3.5 ounces. That’s a good size for bake sales, but if you’re baking these for a group, you might want to go with 32 squares. The other changes I made to the original recipe were to increase the baking time from 15 minutes (I’m pretty sure that was a typo in the original) to about 50, add 1 1/2 teaspoons of vanilla, and add a full teaspoon of salt to make up for the unsalted butter. I also sprinkled M&Ms and chocolate chips on top of the hot brownies. Why not? Preheat the oven to 350 degrees F. Line a 9x13 inch pan with nonstick foil or parchment paper. In the bowl of a stand mixer with a paddle attached, beat the butter, salt (if using), both sugars, cocoa powder, corn syrup and vanilla until well mixed, scraping sides of bowl often. With mixer on lowest speed, add the eggs one at a time, stirring just until mixed. Add the oil and stir until incorporated, then stir in the flour, scraping bowl. This takes some elbow grease because there's a lot of batter and it tends to stick to the bottom of the bowl. Spread the batter in the pan and bake at 350 degrees F. for 45 to 50 minutes or until brownies appear set. 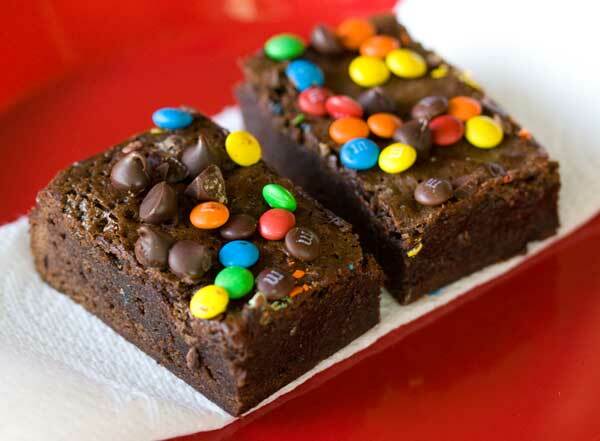 Sprinkle some M&Ms and chocolate chips over the hot brownies. They should melt a little and adhere. If not, you can drizzle melted chocolate over the brownies later and THEN add the toppings. Let cool at room temperature, then chill for at least 3 hours before slicing. I'm convinced brownies taste better the second day, but that's just me. Cut into 16 large or 32 small brownies. Store in refrigerator. We were just there last month & I want to go back already!! I saw the brownies and boy did I want one…we were in search of Goofy Burgers and I was saving the calories for that. They are VERY hard to find, and we ended up only finding 6 between 3 of the 4 Disney Parks and checking out multiple resorts. Now if I could only figure out how to make those…yummmmm. My hubby stayed at The Boardwalk when he was there for a conference (I know, really!!) and loved it. Our fav is The Wilderness Lodge – everything is located in one building, so in the morning you can walk downstairs in your slippers for coffee. Epcot has some fun restaurants. The new Italian place, Via Napoli is really good, and we always enjoy the restaurant in Morocco. Kouzzina is a lot of fun (loved the spanakopita — it wasn’t too greasy), and we also enjoy Shula’s, Blue Zoo and Kimono’s in The Dolphin. We’ve been trying to get into Le Cellier for the past 5 years with no luck, but we always get a reservation at Yachtsman (in Yacht Club) and love it. The waiters are terrific. Has anyone ever stayed at Yacht Club? If we didn’t stay at Shades of Green every time we’d stay at the Boardwalk. It’s the perfect location for the EPCOT Food and Wine Festival, every October. And Cat Cora’s restaurant, assuming it’s still there, is awesome. I can eat brownies everyday. It’s my favorite and it’s so versatile. I’m glad that you had a great time in Disney World. Mary, I know what you mean. It seemed like a ton of sugar, but the brownies really aren’t that sweet. They’re just really dense. Dawn, you are thinking of Beach Club. That was my first choice, but it was booked. As it happened, Boardwalk Inn was very nice, but Beach and Yacht Club are SUPER popular. We love the World Showcase in Epcot, and with airfare being what it is, we were lamenting it’s probably the closest we’re going to get to any of those countries right now :(. Katrina, I think the brownie overload has something to do with the hot weather and summer coming to an end. Brownies satisfy the need for chocolate and the urge to bake, but they don’t require a lot of effort on hot sunny days. Those do look good. I’ll have to add them to my must-make list when I’m in need of more brownies. I think I’m getting brownie overload right now, not from eating them, but from making them. 😉 Someday, maybe someday we’ll make it to Disney. sigh! I love that you go to Disney, a lot. If I could I would go every year. And if you want to walk back to your hotel room at the beach club, the sidewalks are adorned with vines, flowering trees and some of the best cafe french music I’v ever heard.